This has to be one of my most favourite salads - it's a variation on the traditional Greek beetroot salad, patzarosaláta (παντζάροσαλάτα). In Greece, patzarosaláta, is usually served two ways. The beetroot, along with their greens, are boiled. Once they have cooled, they are sliced and served with a generous dressing of olive oil and wine vinegar. This salad is served alongside a dish of skordalia, feta cheese and bread. 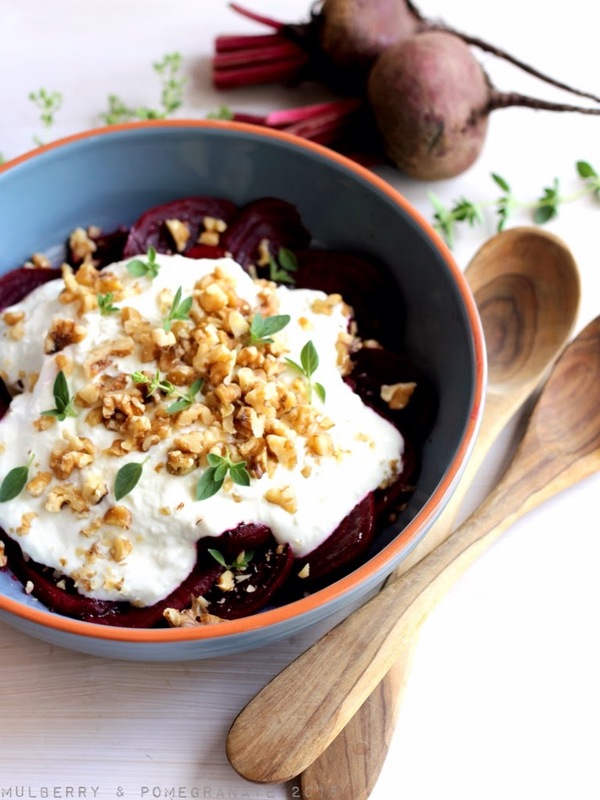 Alternatively, the simply cooked beetroot is cut into small cubes and folded through garlic spiked Greek yoghurt - similar too and often served as an alternative for tzatziki - a pretty soft pink version of tzatiki. The greens are also served - this time as a seperate dish on the side, rather than mixed through with the beetroot itself. My variation of this salad combines these two approaches. 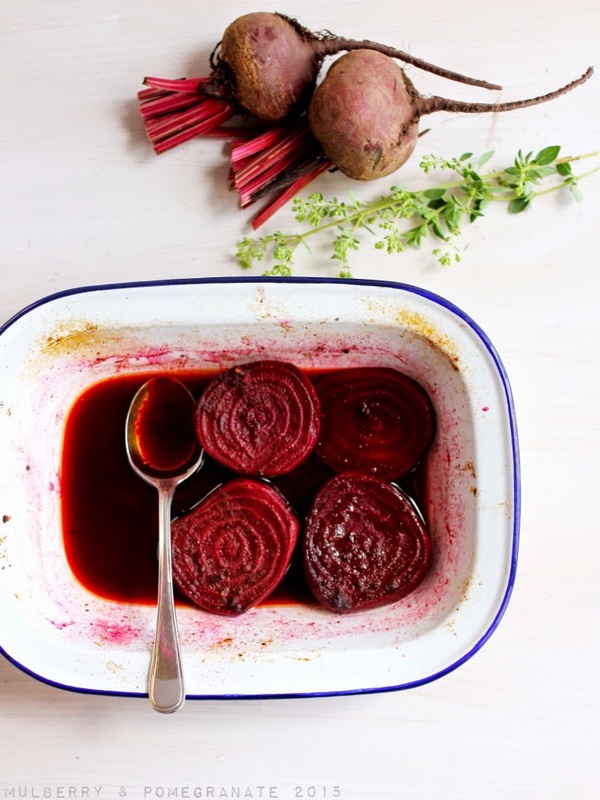 Instead of being boiled, I roast the beetroot with a little balsamic vinegar to bring out its natural sweetness, along with a pinch of cloves to emphasise its earthiness. 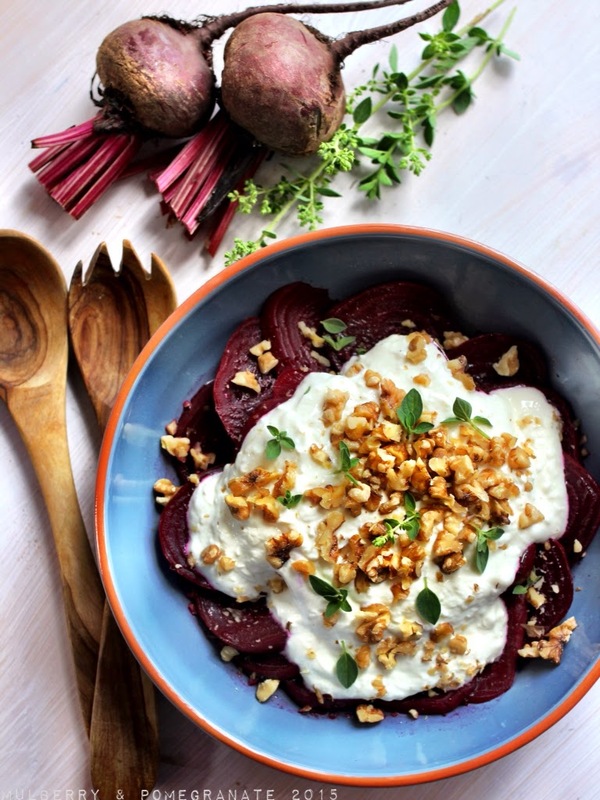 Once it has cooled, the roasted beetroot is sliced and topped with strained Greek yoghurt, which has been given a kick with a little crushed garlic, oil, and wine vinegar. Crunchy walnuts are added for texture and a little more earthy flavour, along with some hot and tangy fresh oregano. The greens are not wasted, I usually simply boil these and serve them with wine vinegar and oil, as a hot salad on the side or reserve them for another meal. 2. Place the trimmed and peeled beetroot in a baking dish. Rub the beetroot with olive oil, salt, pepper and a pinch of ground cloves. Drizzle with balsamic vinegar. Cover the dish with a piece of aluminum foil. Roast for about one hour, or until the beetroot is tender and you can pierce it easily with a fork. Remove and cool. 3. In a seperate bowl fold together the yogurt, with crushed garlic, vinegar, oil and salt. (You can prepare the yoghurt ahead of time and leave it chilling in the fridge - this will make the garlic taste a little stronger). 4. Slice the beetroot and place on a platter and drizzle over a little of the cooking liquid. Then dollop over the yoghurt and finally top the dish with chopped walnuts and a few leaves plucked from the fresh oregano sprigs. Wow, those colours, so vibrant and appetising! This is a salad I could get SO excited about. 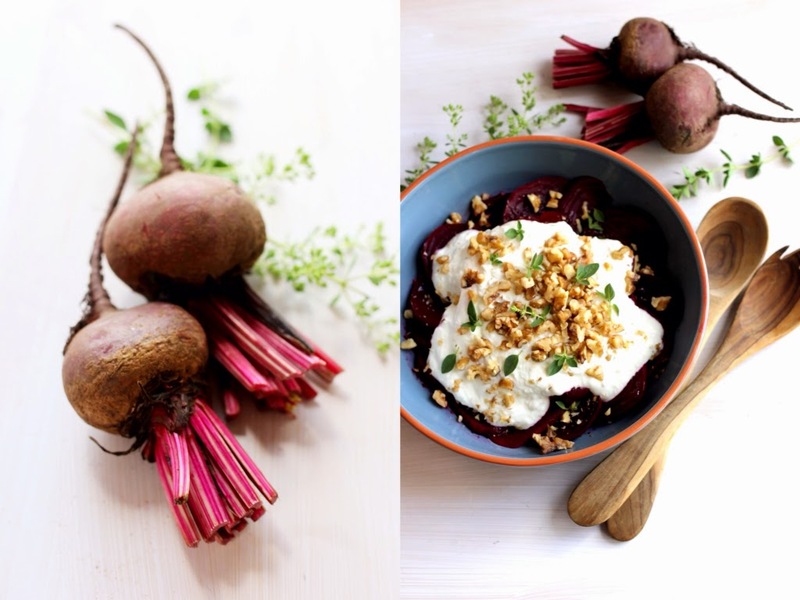 I love beetroot and the yoghurt dressing sounds delicious! This looks amazing. I think my family will just gobble this up...good thing I have all the ingredients to make it for dinner tonight. Thank you! Thank you for your comments, I really appreciate every single one!